Dougal Douglas was born with horns on his head, like a goat, but they fell off in a fight – or maybe they were surgically removed. You never know if Dougal is telling the truth, but he definitely has has two small lumps which can be felt through his curly hair, exactly where horns should be. He has a gleaming, sinister smile and a crooked shoulder, and takes a gleefully malicious delight in turning people’s lives upside down. He may not be actively responsible for the chaos and confusion that trails in his wake, but he seems to act as a catalyst, bringing out the worst in the people he meets, before moving on to wreak havoc in other communities. 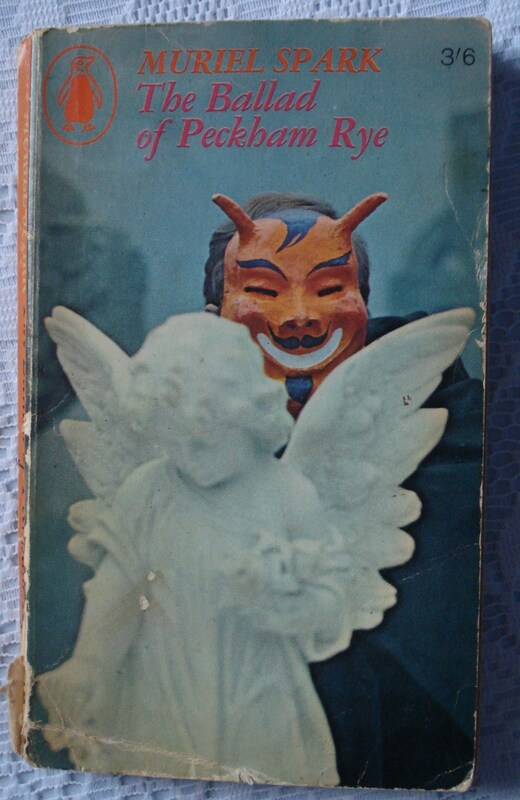 I read The Ballad of Peckham Rye when I was at school (but not for school, if you see what I mean), attracted by the title and the cover – a photograph of a man wearing a smiling devil’s mask, complete with horns, as he peers over the shoulder of a marble angel. It was the first Muriel Spark novel that I came across, as well as being one of the first contemporary novels I encountered (until then most of my reading was classics based). More than that, it was written by a modern woman, and opened up a whole new world in my reading life. I loved the spare quality of the writing, the wry humour, the subversive feel of the book, and the fact that there were no heroes and heroines in the conventional sense, just ordinary men and women going about their everyday lives, completely unprepared for the advent of Dougal Douglas and the devastation that accompanies him. Since then my admiration of Spark grows with each novel I read, and I return, periodically, to the world of Peckham Rye. 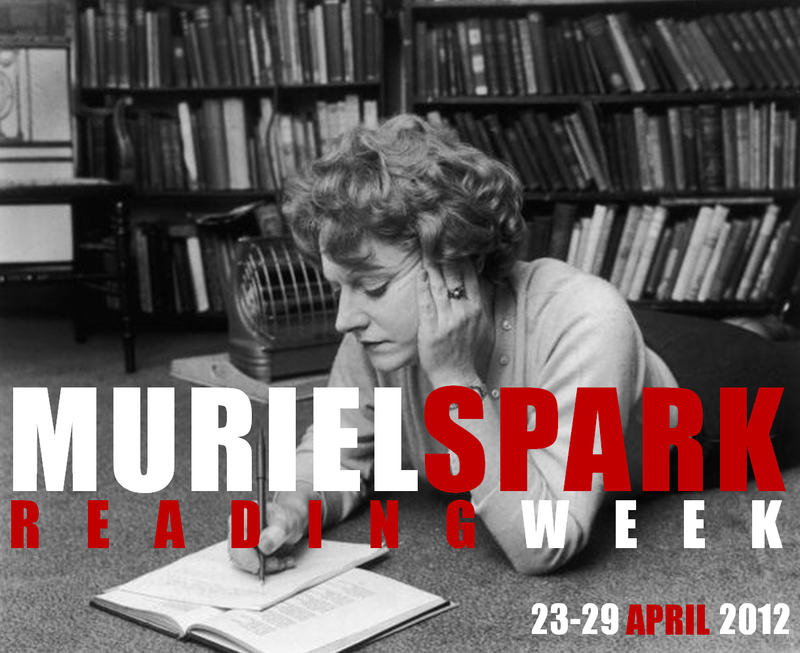 It’s a while since my last visit, but now seems a good time as Simon at Stuck in a Book (http://stuck-in-a-book.blogspot.co.uk) and Harriet at Harriet Devine’s Blog (http://harrietdevine.typepad.com) are hosting a Muriel Spark Reading Week. The book opens with an account of Humphrey Place jilting Dixie, his bride-to-be, as they kneel at the altar. He got to his feet and walked straight up the aisle. The guests in the pews rustled as if they were all women. Humphrey got to the door, into his Fiat, and drove off by himself to Folkstone. It was there they had planned to have their honeymoon. This is only the second page of my battered 1966 Penguin edition, but I’m already hooked. I particularly like the way the guests rustle – it’s such a small, but telling detail. And, intriguingly, although we haven’t yet met Dougal we know that people think he is to blame for the wedding fiasco, that he has given Humphrey ‘disgusting ideas’, and that Dixie has never liked him. Spark’s dark tale. For Dougal is no ordinary rogue. He is, as we are frequently told, ‘different’, and various characters describe him as ‘inhuman’ and ‘unnatural’, or even ‘a diabolical agent, if not in fact the Devil’. Dougal himself insists: “I’m only supposed to be one of the wicked spirits that wander through the world for the ruin of souls.” But maybe he’s just joking – as I said before, it’s hard to know if he’s telling the truth. There he is, dark, devilish, skeletal, mesmeric, otherworldly, steering the interview the way he wants it to go, changing his shape from the stillness of a monkey puzzle tree to a professor, to a television presenter and then, finally, a man of vision with a deformed shoulder. It’s the first indication of how devious and manipulative he can be, making himself whatever he considers will best please others, while suiting his own mysterious purposes. The textile company employs him in an unspecified role, but the exact nature of his work doesn’t matter, as he spends most of his time out of the office conducting human research. Not content with that, he talks himself into a similar job at a rival firm, where he insists on carrying out industrial research in the local community. In addition, he’s creatively engaged in ghost-writing an autobiography for an ageing singer and actress. He attracts and repels in equal measure. Characters who tearfully bare their souls to him find that far from finding solace or resolution, their lives fall apart as their true natures are revealed, with terrible consequences, ranging from mental breakdown to murder. Those who don’t succumb to Dougal’s peculiar charm may keep their souls, but they are still in jeopardy as they rifle through his rented room searching for clues to discover who and what he is. I love the way the dark, fantastical elements of the story sit alongside the humdrum, everyday activities, and Spark’s ability to raise questions about Christianity, the class system, and the moral code of the day so quietly you hardly notice what she’s doing. But there is a lot of humour here as well, often based on her observations of people’s behaviour, like the moment when Dixie’s mother tells her husband (Dixie’s stepfather): “Turn on that wireless. If we’re going to have a row I’m not letting the neighbours get to know.” And poor Mr Weedin gets little sympathy when he admits that sometimes he thinks he is going to have a breakdown. “It would not be severe in your case,”Dougal said. 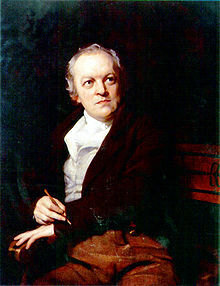 “It is at its worse when a man is a skyscraper. But you’re only a nice wee bungalow.” If that’s not one of the greatest put-downs ever I don’t know what is. Anyway, I’ve rattled on quite long enough, and the only other thing I can say is please read the book.